I imagine that those 1960s and 70s era Christmas variety show specials were as big of a deal in the Winans household as they were in mine. The major difference being that it actually sounded good when members of gospel music’s royal family sang along with Andy Williams and friends. That era with Christmas sweater wearing entertainers dancing and singing through holiday streetscapes can evoke lasting memories – of both the spiritual and natural variety. For a young Ce Ce Winans, the good memories evoked by those specials remain. She, like many of us who recall that era, sat in front of the wood paneled console TV (and there was likely only one) and watched those specials together with her family. The shows stressed faith and family, and everyone who was important in your life was in that house, in that room – or at the very least in the land of the living. 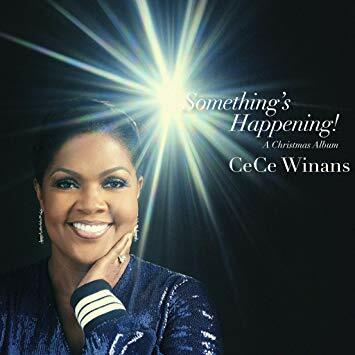 I can see why Winans and her son, Grammy Award winner Alvin Love III, seek to recapture that feel on her soon to be released holiday album Something’s Happening! A Christmas Album. The next track, “The Grace of the Father,” merges classic gospel call and response between Winans and the choir with an arrangement that slips seamlessly between classic holiday pop arrangement into a swinging jazz bass line. Check out the three part round singing on the track’s reprise. Christmas is a time of year makes us feel a certain kind of way. Those emotions we feel stem from what experiences the season evokes. With Something’s Happening! A Christmas Album, Ce Ce Winans said that she sought to remind listeners of the true meaning of Christmas. This record will prompt some listeners to think back to those December nights sitting with family in front of a TV set and singing old and new Christmas songs. Recommended.